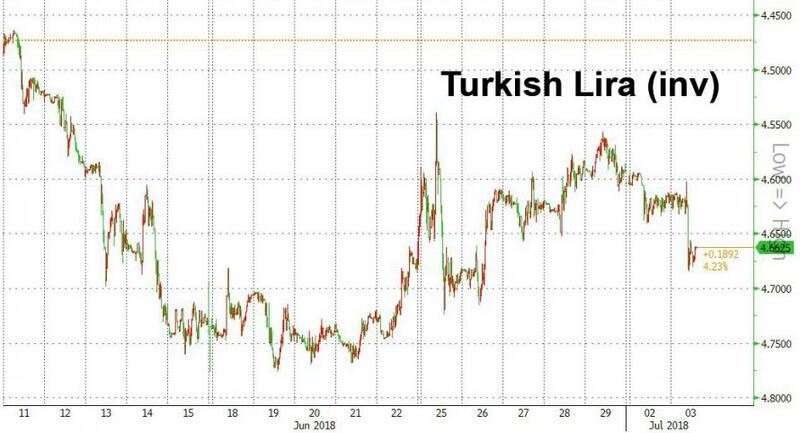 Having stabilized modestly after its mid-June rout, which sent the Turkish Lira to a record low of 4.74 - on the re-election of president Erdogan of all things - overnight the TRY tumbled as much as 1.4% to 4.6813 after Turkey reported that headline inflation soared from +12.1%y/y in May to +15.4%y/y in June, significantly above the 13.9% y/y consensus expectations. This was the worst inflation print since the runaway inflation days at the start of the century, and the highest since October 2003. The monthly jump in inflation of 2.61%, was more than double the median Bloomberg estimate and higher than the highest est. of 1.8%. As Goldman details, prices rose across the board: Food and nonalcoholic beverages inflation increased by 7.9pp to +18.9%yoy, on the back of a sharp rise in vegetable prices, and accounted for 1.8pp of the overall 3.3pp rise in the headline figure. Core inflation also increased sharply, from +12.6%yoy in May to +14.6%yoy in June, above consensus expectations of +13.4%yoy. The rise in core inflation was broad-based with all major categories except education registering increases. Nevertheless, the sharp rises in the purchase of vehicle and telecommunication services categories were notable. Understandable, currency traders were shocked at the print, which if anything is an underestimation of real price tendencies, and sent the Lira sliding to the lowest level against the USD since June 26. In light of Erdogan's recent comments, some of which have gone so far as suggesting the president may soon take over the rate-setting process himself making the Turkish Central Bank redundant, commentators were horrified at today's data: commenting on the number, Medley Global EMEA analyst Nigel Rendell warned that "if policymakers react with only half-hearted measures, President Erdogan’s new term in office will quickly morph into a financial crisis", quoted by Bloomberg. Not mincing his words, Rendell said that "these are truly awful numbers, which came in much higher than anyone expected" and in case there was any doubt, he added that "the inflation genie has escaped in Turkey and is running wild!" He also said that June inflation data piles "huge pressure on the central bank to raise rates again - and to hike significantly at their July 24 meeting - if they want to reverse this trend." 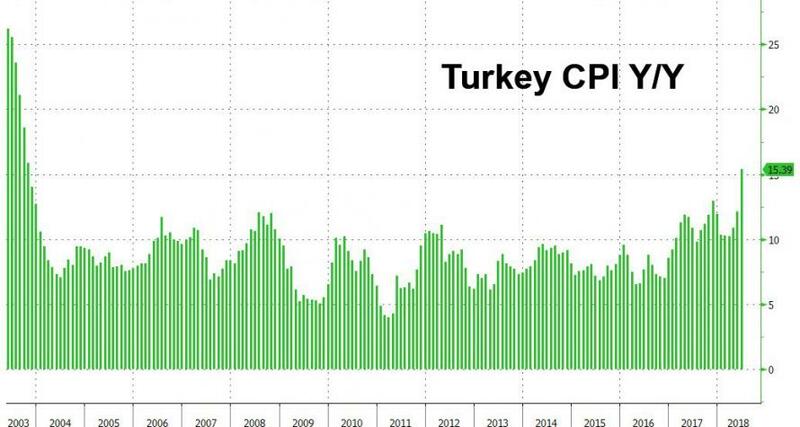 That may be a problem as Erdogan has repeatedly stated that he will push back against further rate hikes; in fact, some speculate that the recent rise in Turkish rates was as much of a concession as the central bank could extract from the president who now has full executive powers. To be sure, Goldman was far less convinced that an emergency rate hike is coming, saying after the inflation data that the bank's forecast "is for rates to be on hold well into 2019." On the one hand, a more elevated inflation trajectory will imply that real rates will be lower and less restrictive. On the other hand, various activity-related data (including our CAI, PMIs and real loan growth) are showing some signs of slowdown. Moreover, we think that both political and economic costs of raising rates are rising and we highlighted the risks of a harder than desirable landing before. Therefore, we continue to forecast that rates will be kept on hold, assuming that the economy will slow down. Given the large external deficit, we think that the TCMB is unlikely to react to TRY weakness by itself as long as the weakness does not undermine financial stability. This suggests that TRY longs may be on their own now, especially if Erdogan bars any aggressive tightening in financial conditions, and as long as there is no outright economic crisis, Turkey will gladly take the surging inflation and Lira weakness, especially if it helps the country inflate away its debt.